Open: Monday to Friday 8:30 a.m. to 5 p.m. Saturday 9 a.m. to 3 p.m. On Sundays, 10 a.m. to 3 p.m.
Far from the center of Detroit when it opened at the end of the 19th century, lovely Woodlawn Cemetery is now an oasis not far from the notorious 8 Mile Road, which once served as the boundary between the inner city and the wealthier suburbs. 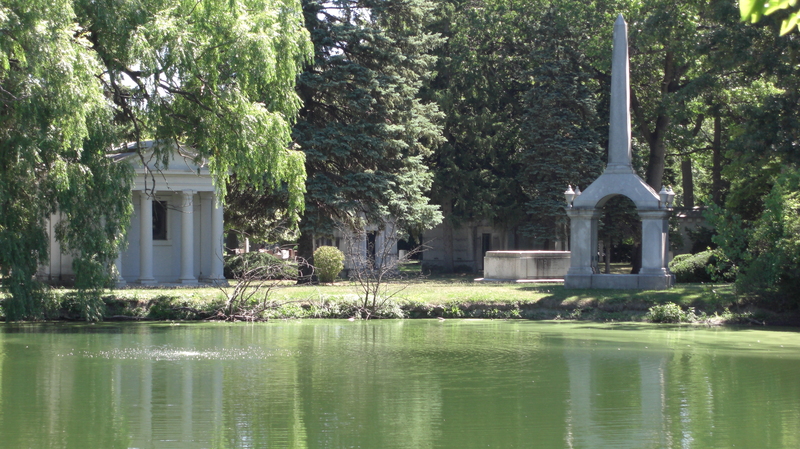 Woodlawn Cemetery has one of the largest collections of private mausoleums in the country. These run the gamut of architectural styles from classically Grecian to Egyptian Revival to Art Nouveau and styles even more modern. In fact, Woodlawn appears to be a cemetery of tombs more than a cemetery of graves, so its decorations are different than the statuary you find in most graveyards of the Victorian age. In The Last Great Necessity, David Charles Sloane talks about the paradigm shift represented in lawn-park cemeteries like Woodlawn. As Americans retreated from Victorian sentimentality, the appearance of cemeteries changed to “combine the beauty of the lawn with the artistry of the monument.” Cemeteries became “a private, permanent burial place that honored rural values and celebrated lot-holder families [and reflected] the distancing of the living from the dead.” Woodlawn features over 150 private estates. 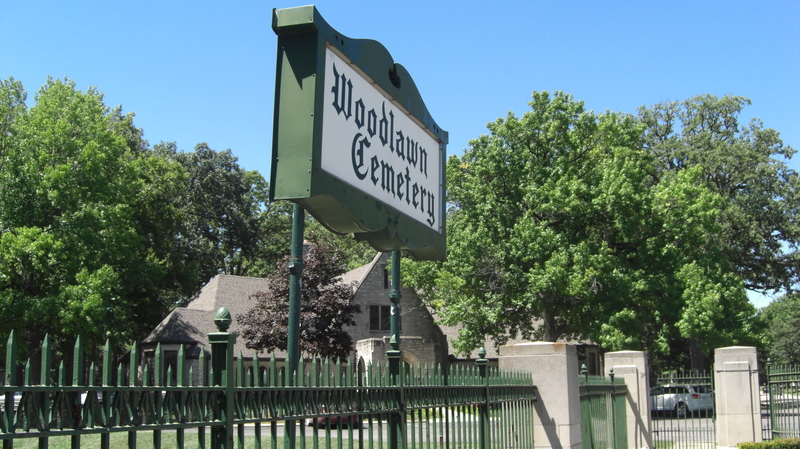 Now managed by the Midwest Memorial Group, which operates 29 cemeteries in Michigan (13 in the Detroit area alone, including the last Cemetery of the Week, Woodmere), Woodlawn seems in good shape to move into the future. Maintenance crews were busy when I visited in August. 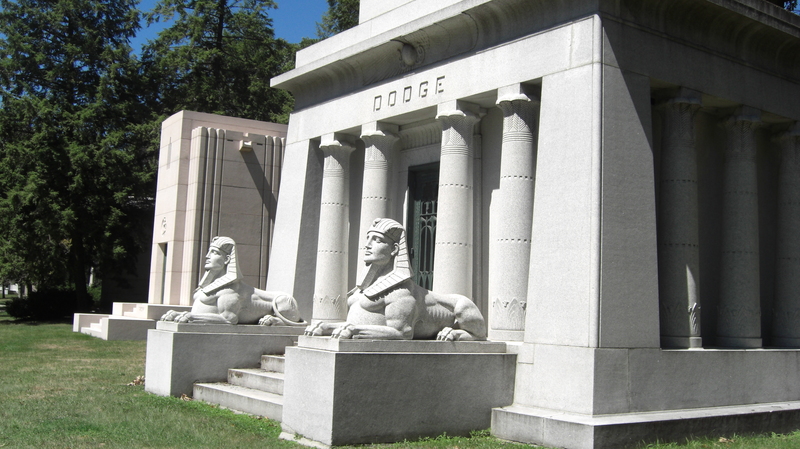 Among the permanent residents of Woodlawn are several titans of the auto industry, including the Dodge brothers, John and Horace. In 1901, they opened a machine shop in Detroit that built motors and steering gear for the earliest Ford cars. Eventually they owned 20% of the Ford Company. They used money from their stock sales to finance their own car company. 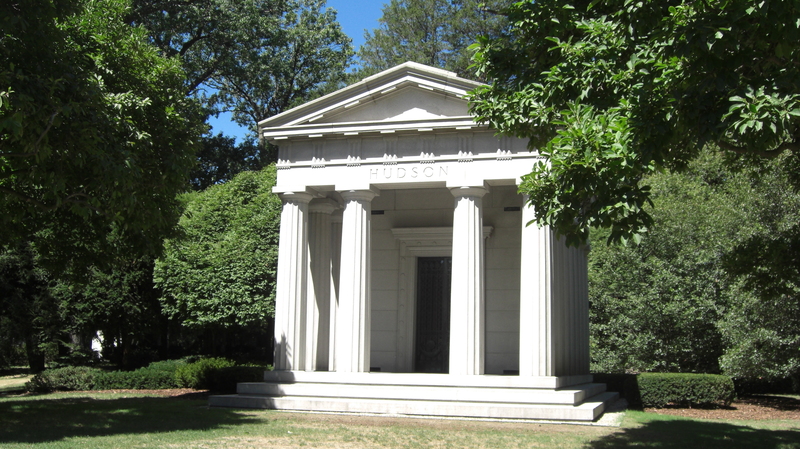 The brothers died within a year of each other and are entombed in an Egyptian Revival mausoleum guarded by sphinxes. Also buried here are Edsel Ford and his wife Eleanor. Edsel, son of Henry Ford, served as president of his father’s company for 24 years. He was also deeply involved with the Detroit Institute of Arts, underwriting the amazing murals painted by Diego Rivera. 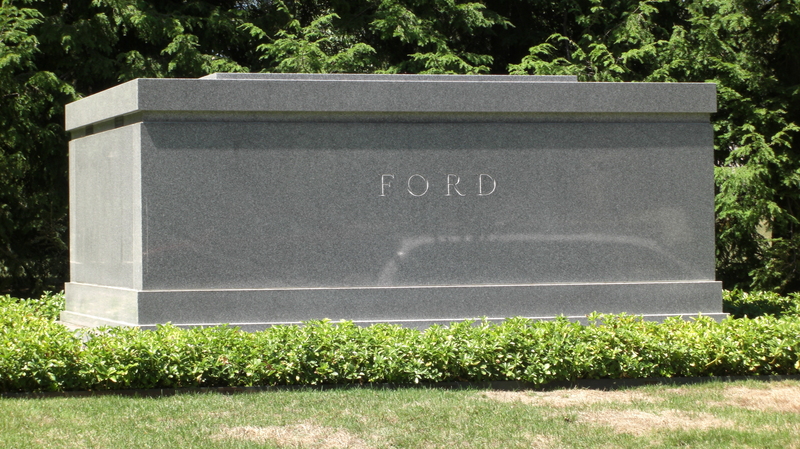 Edsel Ford’s simple black sarcophagus seems to comment on the more ostentatious monuments of lesser-known men. Perhaps not well known outside of Michigan, J. L. Hudson opened a men and boys’ clothing store in Detroit in 1881. It expanded into a department store that was the third largest in the nation by 1927. Eventually the flagship store contained 49 acres of floor space, but as the city died around it, it could not hang on. The building was spectacularly demolished in 1998. Inside the Chapel Mausoleum lies Civil Rights pioneer Rosa Parks. In December 1955, Mrs. Parks refused to give up her seat in the designated “colored” section of a city bus so that a white man could sit down. Her arrest sparked the Montgomery Bus Boycott, spanning over a year, and resulted in a US Supreme Court case that called segregation on public transit unconstitutional. She died in Detroit in 2005. My review of A. Dale Northrup’s Detroit’s Woodlawn Cemetery is here. My review of Richard Bak’s Boneyards: Detroit Underground is here. This entry was posted in Cemetery of the Week and tagged Detroit cemetery, Michigan cemetery, private mausoleums, Woodlawn Cemetery. Bookmark the permalink. What a beautiful place! Recently a blogger posted something new for QR in cemeteries. You probably already know about it but I am providing the link if you are interested. Thanks for sharing the link! I wish more gravestones had QRs, and columbarium spaces, too. The stories of people in graveyards are so fascinating. I wish there was an easier way to discover them.